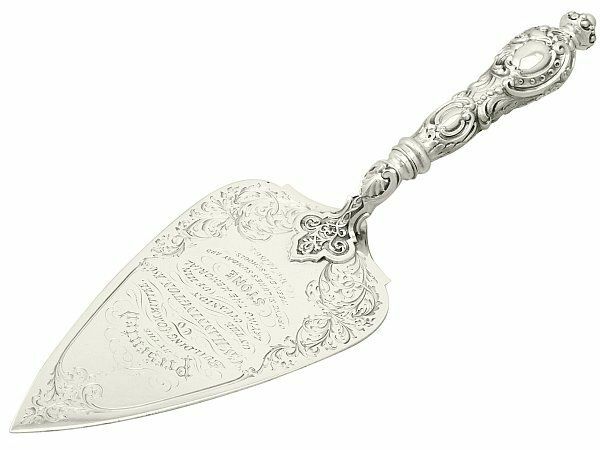 This exceptional antique Victorian sterling silver presentation trowel has a rounded triangle shaped blade. 'ËœPresented by the building committee to C.S Hannington, Esq on the occasion of his laying the memorial stone of the St Luke's Sunday and week day schools. Nov 14th 1864'. The antique silver trowel retains the original exceptional handle embellished with fine and impressive chased bead, scroll and leaf ornamentation on a matt background with a bead decorated coronet style terminal. The decoration to the handle incorporates vacant shaped cartouches to either side. The bolster of the handle is embellished with an exceptional bordered chased decorated interlacing leaf design leading from a scroll and shell style ornamentation. This antique presentation trowel is an exceptional gauge of silver, exceptional quality and in excellent presentation condition. The chased decoration is very sharp and the bright cut engraved decoration is very crisp. Full hallmarks struck to the reverse of the blade and to the handle are all very clear.